McDonald’s have reached out to Charles Ramsey, the man being dubbed a hero and a legend in Cleveland and told him they will be in touch as yet another hilarious interview with Ariel Castro’s neighbor hits the internet. 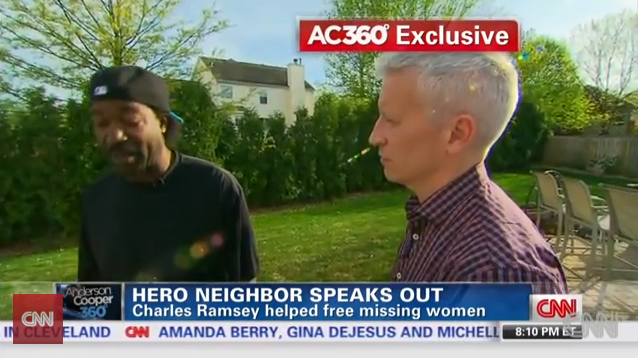 Charles Ramsey, who is responsible for freeing Amanda Berry and two other women who were being held captive at his neighbor’s home, joined CNN’s Anderson Cooper to re-tell the events of the heroic evening which led to the freedom of Amanda Berry, Michelle Knight and Gina DeJesus. In a lengthy and animated interview with Anderson Cooper, Charles Ramsey describes the moment he heard Amanda Berry screaming from his neighbor’s home, the dramatic moment he kicked the door in to rescue her and the 911 call he made to the “moron” dispatcher, all while holding his half-eaten Big Mac. Charles Ramsey revealed that he actually spoke to Ariel Castro earlier that day because the mail man had put his mail into Ramsey’s mailbox. He said that Ariel Castro drove off and he cycled to McDonald’s. Charles Ramsey, who is a dishwasher, brushed off his hero status, telling Anderson Cooper that he just had to “do the right thing”, adding: “Bro, I’m a Christian, an American, and just like you. We bleed the same blood, put our pants on the same way. He also revealed he is traumatized and has had trouble sleeping after learning what was taking place right next door to him. He also says that any reward money should not be given to him, but to the three women who had lost so many years of their lives being held captive. “I tell you what you do, give it to them… you know I got a job anyway” he said before pulling out his paycheck that he just picked up and showing it to Anderson Cooper. Yesterday, after giving several zany interviews which catapulted him to internet celebrity status, Charles Ramsey’s mentions of McDonald’s caught the attention of the fast food chain. Charles Ramsey’s expletive-filled 911 call is garnering just as much attention as his interviews. He explains to the dispatcher: “Hey bro I’m at 2207 Seymour Avenue, West 25th. Hey check this out, I just came from McDonald’s right? And I’m on my porch eating my little food and this broad is trying to break outa the f***ing house next door to me. The dispatcher asks Charles Ramsey to calm down and slow down and tries to ascertain what is happening and where they are. He explains that he is looking at Amanda Berry, who is on the phone with a different dispatcher. Charles Ramsey explains that she is white, but her child is Hispanic and that she is wearing “a white tank top and blue sweat pants”. Charles Ramsey is then asked if Amanda Berry needs an ambulance and he can be heard shouting over to her.